Living in the desert southwest we are blessed to have the ideal climate for citrus trees. Citrus trees, due to their non-deciduous nature, are able to thrive in our mild winter and spring months, and then slow their growth in the colder and hotter months. Due to their ability to slow their growth, versus going dormant, citrus trees maintain their leaves and beauty all year long. They do not, however, grow as well in areas that experience a great deal of Frost, such as Northern Arizona They must be protected during any periods of frost, as well as periods of extreme heat because of their high susceptibility to frost damage and sun burn. In the winter months, during periods of Frost, you will want to look towards covering your citrus trees with burlap or cotton, such as old sheets, and you will want to be sure to never use plastic. During the hot summer months you will not want to prune your trees, and only sparingly if needed. The foliage of the trees help to protect their sensitive branches from sun damage. The trunk of a citrus tree is just as sensitive, but it can be easily protected by painting the trunk with a 50/50 mixture of white latex paint or wrapping the trunk shade cloth or burlap. As many citrus tree fans know, the flowers produced by the trees can be extremely fragrant, which attract a variety of pollinating insects that are responsible for the fruit production. Some citrus varieties, such as lemon and lime trees, can even produce the fragrant blossoms all year long. Surprisingly enough, however, only about one to two percent of the fragrant blossoms produced by one tree will actually yield fruit. Keep in mind that the average citrus tree will not begin producing fruit for two to four years, and it has been found that they will produce anywhere from one to one-thousand pounds of fruit per growing season, which generally occur during February and March, and once again from August to October. 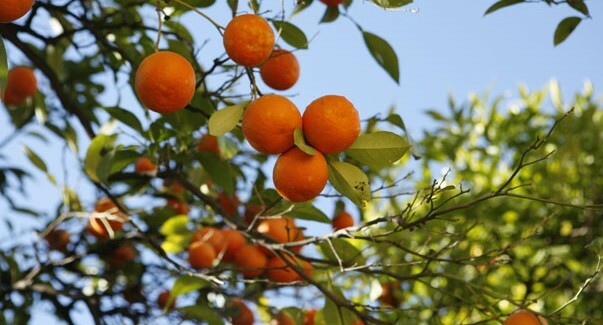 Would you like ideas on different types of citrus trees, or do you need to know of a great place to buy citrus trees?! Greenfield Citrus is one of my favorite citrus tree providers in the valley. Posted on October 2, 2013 by The Garden Guy. © 2019 The Organic Garden Guy. Website design by iCandy Graphics & Web Design in Madison, WI.